Healthy cookie crumble smoothie recipe | Quick healthy breakfast recipe! Healthy cookie crumble smoothie recipe PLUS Vitamix has officially rocked the blender world! You know we love smoothies and this healthy cookie crumble smoothie is officially our new favourite smoothie recipe! BUT we have even more exciting news for you… the Vitamix® Ascent® Series has just stirred up the blender game with their new cups and bowls range. Honestly, we want to invite you all over to see just how epic it is. But instead, we will share everything on our Instagram stories! Be sure to check them out. The Vitamix® Ascent® Series lets you build your own personalised blending system by adding a range of compatible container sizes, along with the blender jug. Plus the blender will actually recognise the different containers and automatically adjust blend settings for their size. We told you… they are seriously upping the blender game! Solving our kitchen problems left right and centre! The small bowl is perfect when you want to whiz up a healthy nutty basil pesto, nut butter, fruit and veggie purees, sugar-free icing, paleo chocolate or in the case of this cookie crumble smoothie we used it to create the raw cookie crumble mix. Yes. We know. EPIC. This new little bowl solves a huge problem in the world of blenders. You know when you are blending ingredients and it’s only a small amount of ingredients so the blades don’t reach the ingredients to actually blend? UH! Talk about frustrating. You’d have to keep stopping the blender, mixing it around and praying it would blend the second, third, fourth time round. This used to happen to us all the time! So instead of taking a minute to blend the paleo chocolate or pesto it would take 5 minutes! THANK YOU Vitamix® Ascent® Series bowl, we love anything and everything that saves time in the kitchen! But wait let’s talk about the travel cup attachment! This Vitamix® Ascent® Series blender is a (smoothie) girl’s best friend. You’ve been making your green (ok ours definitely usually look more chocolate than green haha) smoothie every day. You whiz it up in your blender, pour into the cup and enjoy. With the Ascent series, you ONLY use the travel cup container. Whiz it, flip it, unscrew the blade attachment, screw on the lid and boom you have a smoothie to go! We also love the new cups and bowl addition for storage purposes. Hands up if you’ve ever accidentally made enough smoothie for 2 (or 3) when there’s only 1 of you. We both have… yes, even when you have a recipe app and blog you can still get this epically wrong! So instead of drinking all the smoothie and feeling like you have an ocean inside of you, or wasting it down the sink, or covering the glass with plastic wrap, simply drink what you can, pop the lid back on and leave the rest in the fridge until it’s smoothie time again! Plus the blending bowls come with lids! These make meal prep a dream! Make your sauces, dips, nut butter, chocolate, purees. Whack the lid on, pop into the fridge to enjoy at a later date. Far out Vitamix, you’ve done so good! You’ve thought of EVERYTHING! 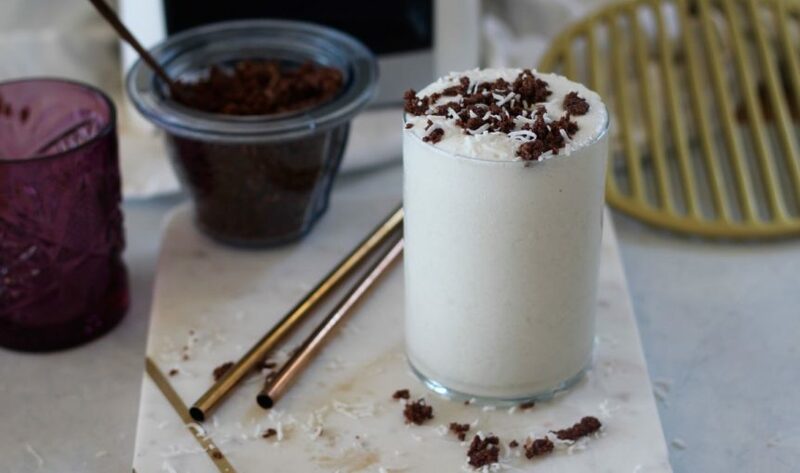 We hope you enjoy this cookie crumble smoothie. We know it will be on high rotation in our kitchen! Ps. share your smoothie creations with us on social media! We’d LOVE to see them! * It’s an absolute dream to work with a company like Vitamix. We only choose to work with brands and products that 100% align with our vision and mission to inspire a healthier, happier, more love filled planet. Everything we share about Vitamix is an honest and true opinion, it really has changed the way we cook and live. Be sure to check them out. Start with the cookie crumble. We used our NEW Vitamix® Ascent® Series with the blender bowl attachment. Simply place all crumble ingredients into the bowl, screw on the blade base and blend on level 1 (low speed) until combined. Set aside. Now for the smoothie! We used the NEW Vitamix® Ascent® Series 600ml travel cup attachment. Simply screw on the blade base, add all the ingredients, and blend until nice and smooth. Give it a taste test and add any extra maple syrup if required. Top with cookie crumble and enjoy straight away from the travel cup (so epic!). Or pour into another glass and enjoy. Store leftover cookie crumble in the fridge. If you have a Vitamix® Ascent® Series simply, place the lid on the blender bowl (ahh epic again). If you love chocolate like us we also recommend you add extra cookie crumble and stir it through. It’s kind of like a healthy milo! Also… why wouldn’t you do this? !